Twenty-eight years is a long time to keep saving the same princess. Nintendo has finally hipped to the idea that things need to change within The Legend Of Zelda, and they’ve been saying as much in interviews for the past few years. Even with that foreshadowing, the announcement of Hyrule Warriors—a battlefield beat-’em-up in the Zelda universe—was something of a surprise. Teaming Nintendo with Koei Tecmo and Team Ninja, the game takes the rough structure of the Dynasty Warriors series and fills its every nook and cranny with Zelda ephemera and fan service. But would such a collaboration result in a game greater than the sum of its parts, or would it suffer from the same conventions that have kept both franchises predictable for so long? The kingdom of Hyrule is under attack yet again, and Princess Zelda leads her army—which includes her personal guard Impa and Link, a promising new recruit—into action. Gone are the labyrinthine dungeons, head-scratching puzzles, and character-building fetch quests of Zelda tradition. In their place is a version of Hyrule that offers sprawling battlefields for armies of thousands for players to hack through. Without concern for finesse or exploration, Link and friends run head-first into battle, knocking aside dozens of opponents with every flick of the wrist. It’s the sort of grandiose power trip that helps alleviate the fact that none of this makes much sense, as the fun of being a battlefield deity outweighs that niggling concern. 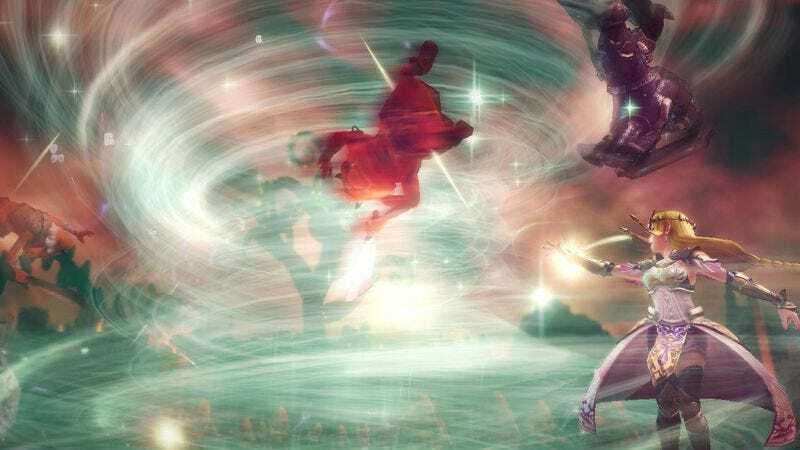 By using the familiar locations, characters, and items of the Zelda games, along with the attention to detail that has become Nintendo’s signature, Hyrule Warriors is by far the most accessible entry in the Dynasty Warriors family. It feels more refined, with clarity of scope and a greater sense of agency in combat. At the same time, this is the least accessible Zelda game thanks to its truncated story and reliance on series history. Players without at least a casual familiarity with the events of past Zeldas might be left in the dark on many of the story’s beats. Sheik’s identity, Midna’s curse, and the significance of pumpkin soup are all important elements in the plot’s development without ever being explicitly explained. That same roadblock for new players may ultimately be the biggest selling feature for staunch Zelda loyalists, though, as Hyrule Warriors is bursting at the seams with love for its source material. The campaign’s story, loose as it may be, visits the environments of Ocarina Of Time, Twilight Princess, and Skyward Sword, recreating key moments from each as sprawling battlefields as opposed to methodically paced adventures. Familiar foes and enemies pop up in battle—spoiler: Dodongo still dislikes smoke—and recognizable objects from Zelda history litter the skill tree of each character, such as the Fierce Deity’s mask, Din’s Fire, and the Zora Tunic. While the game explains the effects of each upgrade, their names would be pure gibberish to anyone but a well-versed Zelda fan. Perhaps the biggest draw for those in the know is the opportunity to play as other characters from Zelda mythos. There are 13 characters in all—eight of whom are female, a pleasant change of pace—and each demonstrates unique strengths and weaknesses that make them ideal for different types of combat. Ocarina Of Time’s Darunia is a slow bruiser with devastating hammer attacks, while Skyward Sword’s Fi is a nimble figure skater who methodically pirouettes her way through the oceans of baddies. Every fighter comes with several customizable weapons and skills that are bolstered with the multitudes of raw materials and rupees dropped by foes every battle. One area where Hyrule Warrior sets itself apart from typical Zelda adventures is in its quest to keep players coming back for more. There may not be a lot to do after the credits roll in Majora’s Mask or A Link To The Past, but that is exactly where the largest chunk of the game begins here. Revisiting all of the scenarios as any unlocked fighter is a welcome option, and the punishing challenge mode that pits players against an onslaught of foes with specific win requirements is a pleasant time sink. It’s the game’s adventure mode, though, that shines in both length and fan service. It’s based on a faithful recreation of the world map from the original Legend Of Zelda, with each section of the grid housing a specific battle with its own rules: Defeat 500 enemies in under 10; defeat Sheik with one of the “dark” class of weapons; defeat only the opponent wielding an ax. While Hyrule Warriors could’ve gotten away with a simple “you got your chocolate in my peanut butter / you got peanut butter on my chocolate” mash-up and wiped their hands all the way to the bank, the end product is more of a love letter to its audience than either series could have attempted on its own. This may not count as a proper Zelda game, but it is still a valiant step forward for both Zelda and Nintendo in its efforts to explore new territory with the nearly 30-year-old series. Though the game practically demands Zelda fanaticism in order to appreciate its constant nods to series history, the depth that fan service runs into every crevice of Hyrule Warriors shows how deep the love for these games is.